South Africa just made history, and every black woman proud, with its first female- owned airline, Fly Blue Crane, that made its first international trip this month. Since its founding, September 2015, Fly Blue Crane has primarily operated domestically within South Africa. As of May 13, however, the airline launched its first flight from Cape Town to Windhoek. CEO and Founder of Fly Blue Crane, Sizakele Mzimela, is no stranger to history-making and leadership. She also happens to be the first woman to be selected to the Board of the International Air Transport Association, and the first black executive vice president of South African Airways. If you’re wondering how Mzimela climbed so far up the professional ladder that she saw fit to take the reins herself, know that since 1991 her professional progress has been steady and upward. She startedÂ herÂ careerÂ as researchÂ and development manager at Standard Bank’s Small Business DivisionÂ in 1991 before joining SouthÂ AfricanÂ Airways in 1997 as market analyst, where she gained extensive experience in different business unitsÂ ofÂ theÂ airline affording her the leverage to an Independent Non-Executive Director of Cargo Carriers Ltd before serving as an executive director of South African Airways SOC Limited. 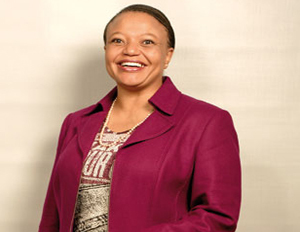 She was also executive director of South African Express Airways SOC Limited. Naturally ambitious, Mzimela had her sights set on taking Fly Blue Crane international since founding. “We hope to expand our flight destinations to Botswana, Namibia, Zimbabwe and the Democratic Republic of Congo.â€ she disclosed to Anna.Aero.com back in 2015 when launching the airline. Color, gender, or nothing else was going to get in the way of Mzimela making it to the top and exceeding expectation. She proved it then, and she’s proving it now.